The Risk Management module in EQS provides tools to identify, assess, evaluate, treat and monitor both hazard and opportunity risks across your organisation. 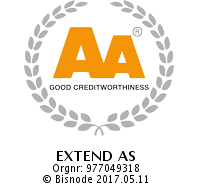 Generally, businesses have a higher risk level than they think. Making wrong decisions that cause your business to not achieve its goals can be fatal for the entire organization. Investigations carried out by Ernst & Young shows that companies that have a strong focus on risk management, also are those who are most profitable. With EQS Risk Management you can identify potential risks, assess the likelihood of their occurrence, consider the consequences of them and prepare actions to mitigate the risks. Visualization of the risks in a risk matrix gives you an overview of all the threats. It shows you which ones are the most critical and thus the ones that should be prioritized. EQS Risk Management supports ISO 31000 and most standards in accordance with regulatory requirements for Risk Management. Through that everyone in the organization can contribute anywhere, anytime, whenever it happens, more risks will be registered and the quality work will be improved. This provides a good basis for retrieving reports and statistics, which in turn makes the system a management tool for the Management. EQS contributes to increased focus on measures and solutions, as well as highlighting risks that provide the basis for proper risk assessments. Risk management concerns everyone in the organization. All employees can help identify risk factors and help reduce the risk of them becoming deviations or accidents. Then the goals must be well known, and it must be easy to contribute to risk-reducing measures, at all levels. Many businesses can save costs, increase production and avoid accidents due to systematic work with security, reliability and maintenance. Good risk analysis strengthens the bottom line, and it’s not just about mapping threats, but also about gaining an overview of what potential you do not exploit. EQS Risk Management can provide information and trends to help you make strategic recommendations. Establishing the context: Functionality which supports the work with defining the external and internal parameters to be taken into account when managing risk, and setting the scope and risk criteria (eg. use of related documents). Risk identification: Elements of risk are found and listed. Risk analysis: An administrator approves the risk elements, and makes an assessment of risk (probable events and potential consequence within each target area). Risk evaluation: The elements of risk can be retrieved from the message list. From there a risk matrix can be made and saved. Links to other related documents in EQS (existing or new) can be created. Risk treatment: Each risk element might be correlated with action, action responsible person, person to approve the action and a deadline for the project. 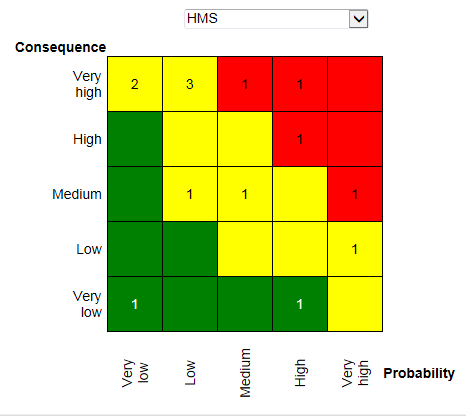 Visualization of risks in a risk matrix makes it easy to see all the hazards, which ones that are the most critical and thus should also be prioritized.